Although I have found two ways of enjoying beetroot - in the form of hash browns, and beetroot bulgar. I am still, always on the prowl for other recipes to encourage me to eat more of this deep crimson vegetable. Another reason I can't completely overlook this root vegetable is that D really likes its flavour. Well whilst surfing the web, I stumbled upon this recipe for 'Beetroot, tomato and cumin pasta' and I just couldn't skip it. It had beetroot for D, cumin seeds for me and pasta. Its been a long while since we sat down and had a good pasta dish, so this evenings meal was decided there and then. The original recipe recommends papparadelle, but I'm quite clumsy with noodle like pasta. 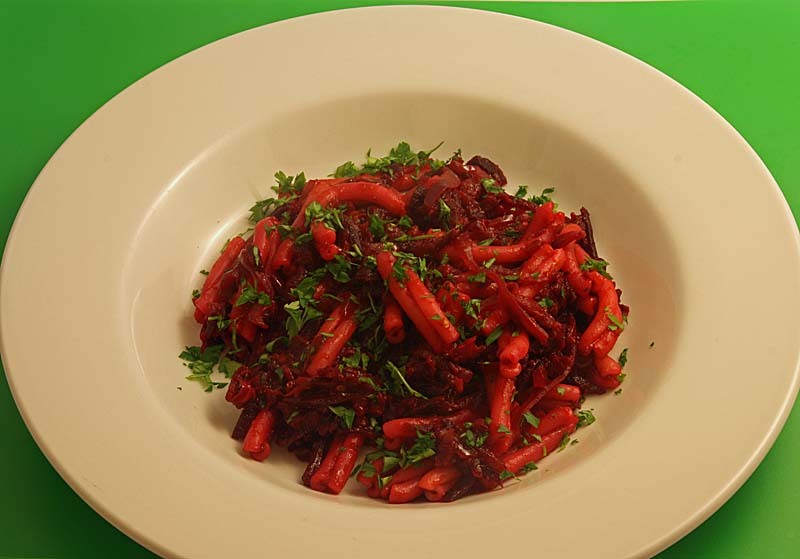 Also at the risk of this beetroot dyed pasta falling off my fork and staining my clothing, I chose casarecce, a pasta that would surely hold and trap both the sauce and the grated beetroot. It was an excellent choice, not a red spot in sight. 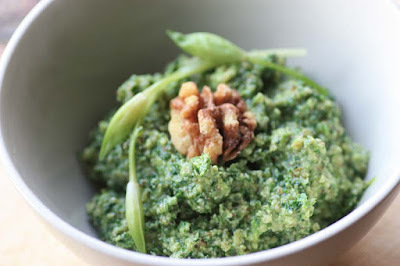 This is quite a speedy recipe to make and one I'd recommend making after work. First it was a delight to watch how the pasta transformed in colour, from plain beige to deep Gothic crimson. Secondly, the flavours were absolutely wonderful. The earthy beetroot was uplifted by both the sweetness of the tomatoes and the zingyness of the fresh lemon juice; and the warmth of the spices came through subtle as a hint. I will definitely be making this again. Its a very red dish, so the scattering of fresh parsley will also make a world of difference to you or your guests eyes. I am submitting this to Presto Pasta Nights or PPN as it is fondly known. 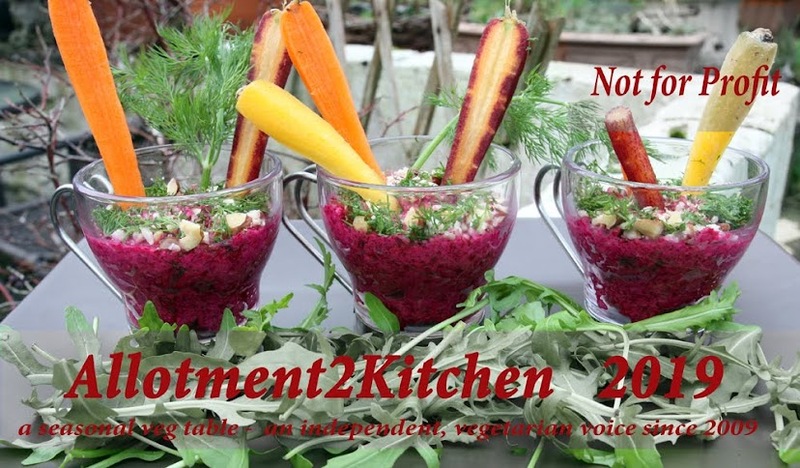 This weeks PPN#199 is being hosted by Ruth of Once Upon a Feast. Ruth was also the inspiration behind PPN. As this is quite an unusual dish and relatively cheap to make, I have also decided to submit this to Good (& Cheap) Eats link-up for What's On Your Plate? Heat the olive oil in a wide pan and stir in the onion. Cook, stirring often, for about 8 min until soft. Stir in the cumin seeds and chilli flakes and cook for a couple of minutes. Add the tomatoes and salt to taste, then adjust the heat so the tomatoes simmer, cooking until thick and sauce like. Meanwhile, peel the beetroot (if necessary) and grate. Stir the beetroot into the tomato and add lemon juice to taste and then scatter over the parsley leaves. When the pasta is ready, drain and stir well into the sauce so that is is well combined. Optional Crumble over some feta if using and serve immediately. Adapted from this recipe. 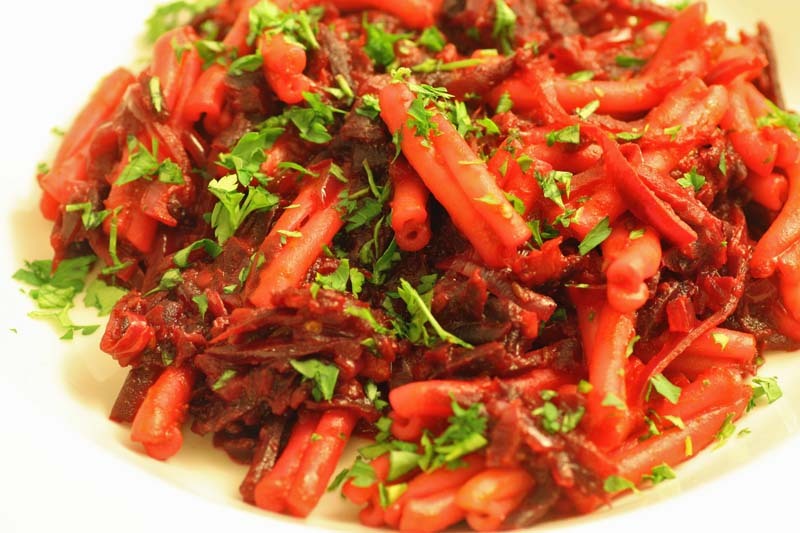 The whole family loves pasta and we eat beetroot too,but have never thought of combining these two.But after this,It's worth a try.Thanks. You know, initially I thought...tomato and beetroot...nah, wouldn't like that...but as I read through the recipe and the different components, the heat of the chili and the aroma and taste of toasted cumin seeds and the dish topped with some crumbled feta...I changed my mind. I bet this was delicious MC...and I do love beets too D! Also love the second photo with the green around the plate..nice presentation! It sounds a bit Asian-inspired with the cumin seed in it. This looks and sounds absolutely delicious; thanks so much for sharing the recipe! I'm a big beetroot fan and eat it most days - roast in the oven with garlic and served as a side vegetable. It also works well with feta cheese in soup! Beets are so healthy for you! I love beet juice, but I am not fond of beets on their own like in salads. I might have to give this a go though! This is a really interesting recipe. New ideas on using beetroot are always welcome. I love cumin combined with pasta...I'm putting this on my list of things to make this week. I've had beetroot 3 ways, boiled (plain), pickled, and diced in salads. 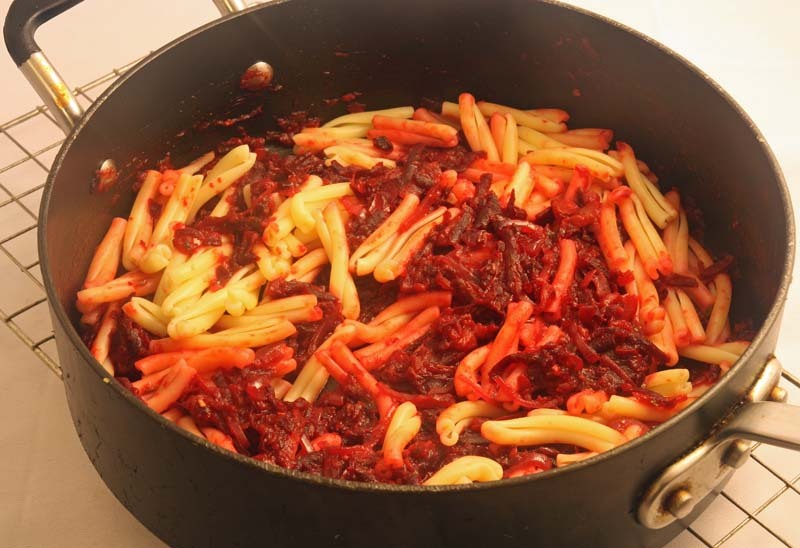 Your recipe is interesting because I'd never thought of combining beetroot with tomato and having it with pasta...I'm going to have to try this! I'll say, I would never have thought of this! It sounds delish!! I'm not a big fan of beetroot, one of my friend does. I'm sure going to give her this recipe. That looks absolutely gorgeous. I love beetroot so this is definitely one for me. Mr OC unfortunately is not a fan of the red stuff, he will have to eat something else that night. This RED dish is soooo cool!!! So interesting and different recipe! And speedy which is soooo importand for everyone!!! Thanks for sharing my sweet Mangocheeks!!!! I love beetroot and pasta! I certainly will. Thank you for sharing. Listen if you liked that rhubarb curry dish last year, I have no doubt this will surprise you too - it certainly did me. It was really delicious. The green around the plate was Ds idea (the amateur photographer likes experimenting) I think it worked as it lifts the colours in the dish too. Sure is a "vibrant" dish! Thank you so much mrs green. 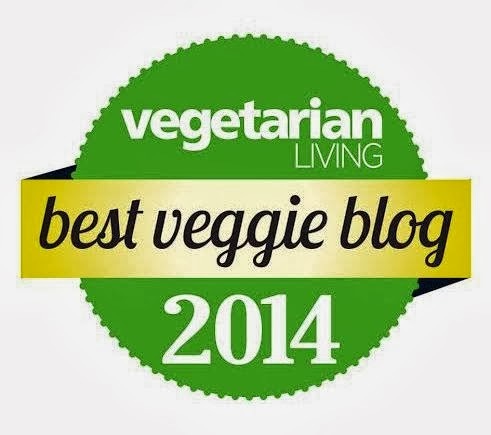 I am so delighted to read that you really like the recipe! As you know now I am not a big beetroot fan, the way you and my husband are, but I think I may have to try it as soup again, this time with feta cheese though! That is interesting that you like beet juice, but not so much beets on their own. Mmmmm I have to encourage you to try this recipe! Please please do let me know how you find it if you get to make it this week :) I'd love to read your opinion. - Boiled (plain), pickled, and diced in salads. Please do make this recipe, I think you might just like it, it does have a sweetness about it and is not that spicy! Honestly, it really works well and was one of the most delicious pasta sauces I've had in a long long time. I can just imagine the flavors in this hearty pasta dish, Mango. And what a lovely color. I absolutely love beets, especially fresh ones. I usually just shred them to eat raw in salads or roast them in chunks... I would have never thought about pasta, nor adding cumin! Can't wait to try this! Thank you so much Cassie. Let me know what you think, if you get round to making this. Thank you for your lovely comment HGourmet Foodie. I agree Beetroot is a messy veg to cook with, but when it gives dramatic colour like that to a dish - then sometimes its worth it. Hi there, thank you for stopping by my blog! It's nice to meet you! This dish looks so absolutely delicious! Very unique and flavorful! Thank you so much for repaying the compliment Emily Z. I am so pleased you like the dish. I agree it is rather unique and it certainly was packed with flavour. This sounds perfect for tonight. I have a few extra cooked beets and the rest of the ingredients, so thanks. Please let me know how you found it. I love pasta,cumin and beetroot but never put these 3 together.I am sure to try this.Will come back and let u know how it turned out.